The CD14 Exo-Flow Capture Kit has all the reagents you need to purify exosomes using FACS—magnetic streptavidin beads, CD14-biotin capture antibody, wash and elution buffers, and reversible Exo-FITC stain (Cat.# EXOFLOW800A-1)—you supply the FACS and the optional magnetic stand (Cat.# EXOFLOW700A-1). 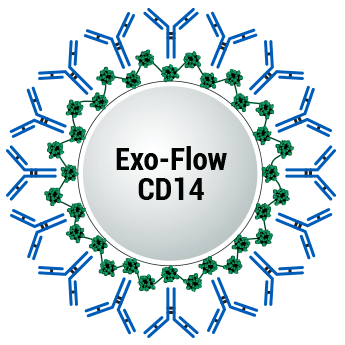 Our well-validated CD14-biotin antibody and high-quality kit components ensure reliable, reproducible exosome purification based on the presence of CD14 on the exosome surface. And with our larger-than-typical bead size (9.1 μm diameter) exosome capture is highly efficient, assisting with recovery of rare exosome populations. To facilitate the widest range of studies, SBI built the Exo-Flow system to be highly modular. We offer a range of biotinylated antibodies as well as a Basic Exo-Flow Kit (Cat.# CSFLOWBASICA-1 with no antibody so that you can use your own biotinylated antibodies. Simply (1) couple the CD14-biotin antibody to the magnetic streptavidin beads, (2) use the CD14-coupled magnetic beads to capture exosomes that have been isolated using either ExoQuick® or ultracentrifugation, (3) wash away unbound exosomes, and then (4) stain with reversible Exo-FITC (excitation and emission wavelengths of 494 nm and 518 nm, respectively). Our Exo-Flow Capture Kits deliver quantitative, highly selective exosome isolation. Bead flow separation data for exosomes secreted by HEK293 cells and captured using our different Exo-Flow Capture Kits. Plots of forward scatter versus FITC intensity show that in the no exosome control, only 0.5% of particles are FITC-positive (left panels), whereas in the exosome-containing sample, 99.3% of particles are FITC-positive (middle panels). The degree of flow separation is shown in the right panels.